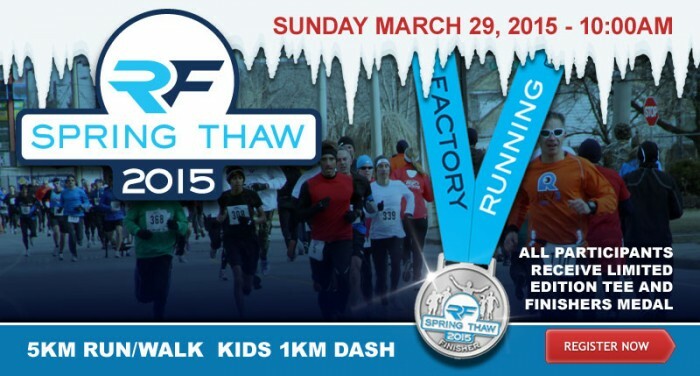 The Running Factory is proud to announce the 2015 Spring Thaw 5k! This fast, flat, and accurate course is a great way to kick off the road racing season with a P.B. The Spring Thaw is a family event that features a 5km run / walk, Kid’s kilometer, and 200 meter Kid’s Dash. Every participant will receive a race-day t-shirt and finisher medal. Prizes will be awarded to the top 3 Male and Female overall finishers and first place finisher of each age group. Promote fitness and fun by joining the RF to thaw out of winter and spring into racing season! Prizes provided by New Balance will be awarded to the top 3 overall Male and Female athletes, as well as the top participant in each age category. All participants in the kids races will receive a finishers medal and t-shirt. Additional door prizes will be drawn during the awards ceremony following the race. For those pre-registered, Race Kit Pick-Up & Late Race Registration will be at the Running Factory (5480 Wyandotte St. E, Windsor, ON) on Friday, March 27 10:00 am-8:00 pm & Saturday, March 28th from 10:00am to 5:00pm. Race Day registration and race kit pick-up will be at the Running Factory from 8:00am - 9:30am. 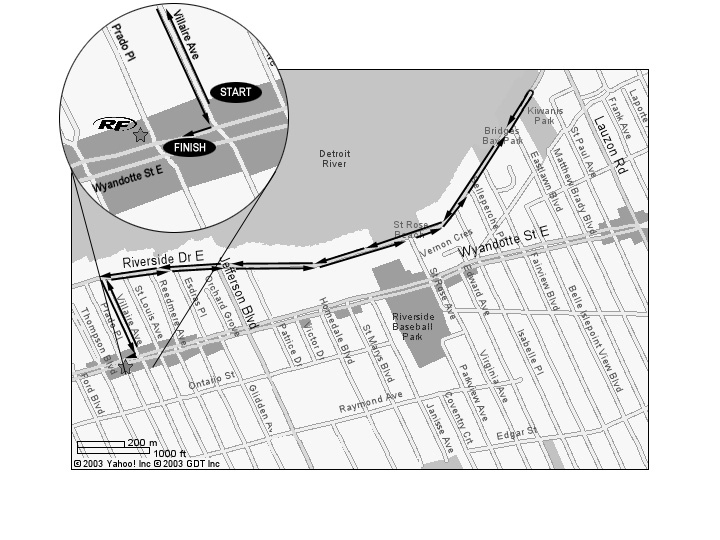 Our 5km run course will begin on Villaire Ave. just one block east of the Running Factory. From the starting line we will head north to Riverside Dr. where we will take a right and head east. The turnaround point will be on Riverside Dr. at Kiwanis Park. From the turnaround we will head back as we came, down Villaire, but will continue and turn right onto Wyandotte St. E. to finish in front of the Running Factory. Water-Aid station located at 1.5 km & 3.5 km mark. For a more detailed view please see our map below. Right off the brdige onto Huron Church Rd. Keep in mind if you are collecting pledges, please register on-line to secure your t-shirt size. Any pledges collected in person could brought to the store on March 27th & 28th or on Race morning. We are pleased to be teaming up with Fitness for Hospice as the official Charity Sponsor of the Spring Thaw 5km .The Hospice of Windsor and Essex County Inc. is Canada's first community-based village concept which has a team of dedicated professional staff and volunteers that provide the very best patient care programs and services to patients and their families both on-site and throughout Windsor and Essex County. The Hospice stands as a symbol of hope as it delivers compassion through support, education and empowerment while providing quality of life. These programs and services are offered at no cost... which is where you come in. It is through fundraising events such as this and the generosity of our community through donations, pledges and participation which allows The Hospice to continue to offer all that they do - FREE OF CHARGE.